We Are All Things Floor Scale! To meet the needs of our customers, we have assembled a comprehensive range of floor scale packages, including popular options and accessories. We also manufacture custom-size floor scales at our facilities when our customer’s needs require unique solutions. In addition to floor scales, we also offer a rotating selection of various other commercial / industrial scales, including special purchase prices. 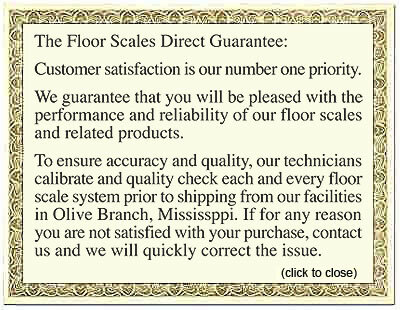 Floor Scales Direct is a full service company, and we ship directly from our facilities in Olive Branch, Mississippi. We are available to discuss your weighing needs – please call us with any questions you may have about our products or services. Floor Scales Direct is a division of Triner Scale & Manufacturing Co., Inc., one of the very first scale companies in the United States. Established in 1897, Triner Scale's early product range included innovative designs in Mechanical Beam and Mechanical Fan scales. Today, Triner continues to incorporate innovative design and rugged durability into a full range of commercial and industrial electronic scales. Triner provides nationwide products and services to companies such as FedEx, UPS, Northwest Airlines, Southwest Airlines, & the United States Postal Service, just to name a few. Triner Scale also designs and manufactures specialized scale systems such as Conveyor Scales, Airline Baggage Scales, Air Cargo and Postal Scales. TOTAL QUALITY AND TOTAL SERVICE.